July 6, 2015 By Tina M Leave a Comment This post may contain affiliate links. Read my disclosure policy here. Happy July everyone! If your weather is anything like mine, it’s wayyy too hot outside to not be eating popsicles of some sort, but at the same time I don’t like to fill my kids with sugar and corn syrup everyday! I am loving that my sister recommended these silicone ice pop maker molds. 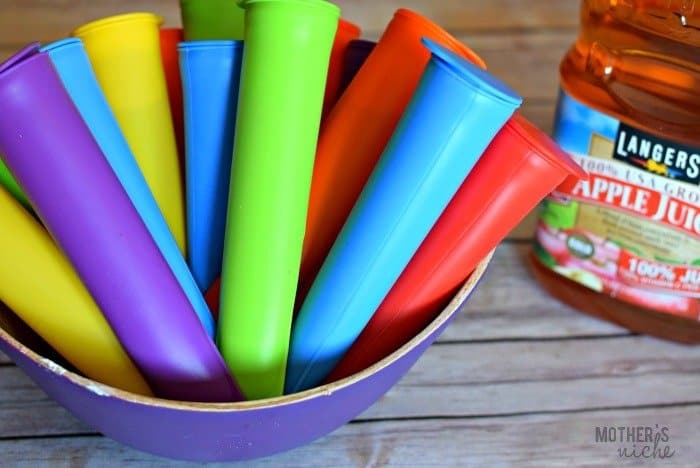 They are perfect for lots of different things: homemade popsicles, Gogurts, or even just for holding small snacks and crackers. I have been using them with 100% juice lately and my kids love them. I just pour the apple juice in, and a few hours later they are ready to go! I was super excited when I saw that Otter Pops were doing 100% juice pops last summer, until I noticed they were tricky with their wording, and in small print it also says “with added in ingredients,” meaning it isn’t 100% juice, they have added sugar! Tricky, tricky. Purée all ingredients with 1/8 teaspoon salt in a blender until smooth. Pour into molds. Freeze until firm. Combine ingredients in a blender and blend until smooth. Pour into the ice pop molds. Freeze until firm. In a large pitcher, stir together the lemonade concentrate and water. Place strawberries into a blender, and puree until smooth. Pour in some of the lemonade if necessary to facilitate blending. Stir strawberry puree into the lemonade. Pour into molds, and freeze until firm, about 4 hours. Dissolve sugar in water by stirring if using superfine or by heating in a small heavy saucepan if using regular granulated (then cool). Blend half of melon and half of lime juice in a blender until smooth. Add syrup and remaining melon and lime juice and purée until smooth. Force purée through a fine-mesh sieve into a 2-quart glass measure or bowl, pressing on solids and then discarding them. Pour mixture into molds and freeze until firm, about 4 hours. Put yogurt in mixing bowl. Pour orange juice and vanilla on top of yogurt. Stir until well mixed. Pour mixture into the ice pop molds, leaving about a half inch space at the top. Place in the freezer and let the pops freeze until hard. Enjoy. Place all ingredients in a blender; blend until smooth. Pour mixture into the ice pop molds, leaving about a half inch space at the top. Place in the freezer and let the pops freeze until hard. Enjoy. Place the blackberries into a blender or food processor. Cover and puree until the mixture is smooth. Pour the blackberry puree through a fine sieve placed over a large bowl to strain out the seeds. Then add the softened frozen yogurt and sugar to the strained blackberry puree and mix well. Pour into ice pop molds, and freeze. Best news? Ice Pop Molds are on Sale right now! Get them HERE.